Rivers were once America’s superhighways. People gathered along their banks. Settlements swelled into commercial and cultural hubs. With shrinking industries and urban flight happening after WWII, waterway traffic declined and riverfronts fell into disuse. Here’s a look at some forward-thinking cities that have turned the process around, bringing riverfronts back to life with a vibrant mix of cultural and recreational opportunities. 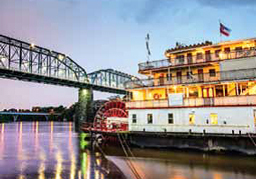 The Tennessee River sweeps through the heart of Chattanooga — established in 1816 as a trading post. Along its banks, the Tennessee Aquarium combines both freshwater and saltwater habitats in its River and Ocean Journey exhibits. Celebrate the aquarium’s River Otter Falls, where visitors can get face to furry face with a romp of otters. Land lovers stroll, jog, or push the baby carriage on the Riverwalk past bright steel silhouettes, marshlands, and creeks all the way to the Chickamauga Dam. Head over to The Block to browse Rock Creek Outfitters and belay your way up High Point’s interior and exterior climbing walls. From the waterfront, it’s an easy climb up the hill to the Bluff View Art District where you can visit the Hunter Museum of American Art and the River Gallery Sculpture Garden — all with water views. Stroll across the Walnut Street Pedestrian Bridge to Coolidge Park to ride a restored 19th-century carousel, play in an interactive water fountain, or launch a kayak. Down by the Water: Amble aboard the River Gorge Explorer for a two hour enclosed catamaran ride with a naturalist pointing out wildlife and historic sites.